Your Greater Fort Myers Condo Experts! Let our knowledgeable, local condo specialists help you find the condos for sale in Ft. Myers, FL to best suit your lifestyle. Fort Myers, Florida and neighboring Sanibel is home to beautiful beaches and well-kept city parks, and Ft. Myers condos offer everything from stunning ocean views to central locations in the middle of the city. If you would like to arrange a showing of condos for sale in Ft. Myers, FL, contact Jean at 941-769-9150 to get started. 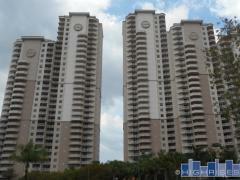 Find Fort Myers area condos currently available for sale here with pictures, pricing and more. View all Fort Myers area condo buildings to see what's available in each. Filter by neighborhood, building type and more. Use our interactive map tools like radius & polygon search to zero in on your favorite areas. Jean Sanders has helped buyers and sellers throughout Fort Myers. Read what clients have to say about her here. Jean Sanders is pleased to present these exclusive condo listings. Contact her for more information. "Jean made selling our condo at the Oasis so easy. She sold it in less than a week and made transaction so smooth. She was very professional and handled all the items associated with the closing. Because we live in North Carolina it really took a lot off us. She was a joy to work with and communicated with us during the process." ~ Tim and Dianne T.
"We had the privilege of meeting and allowing Jean Sanders to represent us in a high rise real estate condo transaction. Jean was willing to show us all available properties in 95 plus degree heat and humidity. She was very patient and knowledgeable with the local market and took us to lunch. Most importantly, she had our backs covered and interests protected during the transaction with the seller. She is very trustworthy and I highly recommend her for any transaction. Jean is a very rare breed of realtor. We will use her on any and all transactions in Florida." ~ Robert M.
If you would like to browse our other featured Ft. Myers condos for sale, please contact us to speak with a local condo specialist and schedule a tour.